If you want to protect your wooden raised beds from the vagaries of the weather, there are some simple and effective steps you can take right now. Once constructed, the best solution is to treat them with the right paint or oil finish. It will make sure your beds remain in tip top condition over time and don’t warp or crack. You might buy pressure treated timber in the first place but most people generally use whatever wood they find handy, including old railway sleepers which add a certain chic quality. Even if you use pressure treated, you’ll still need to finish them in something which will protect the for the long term. Raised beds are an ideal way to create a garden in your yard and can be used to plant flowers but also split different patches of ground for vegetable cultivation. They are easier to maintain and, assuming you have constructed them properly, deliver good drainage. The key to longevity is treating these wooden raised beds properly in the first place. Fortunately, there are some great products available and you should try to use one of these before you fill in the space with earth – you can do it after but you’ll have a much easier time if you do it before! Good treatment maintains the integrity of the wood and ensures you have a gardening plot that is fit for a long time to come. If you have existing beds and need to treat the wood, it’s a good idea to remove the earth and clean the wood thoroughly before coating but understandably in a mature garden this might not be possible. How should I treat my wooden raised beds? Textrol: This is a penetrating wood oil treatment that can be used for both soft and hardwood. It not only provides protection against mildew but also reduces the natural weathering and impact of UV rays on your wood. There are 7 different colours available and its simple to apply with wet-on-wet coats. Textrol protects the wood from within, saturating the pores to prevent moisture form entering the wood. Solid Colour Stain: If you want more colour choice and an opaque finish, our Solid Colour Stain comes in a range of opaque shades and is perfect for treating raised beds. It is highly resistant to peeling and flaking and lasts a long time, guaranteed for five years for horizontal surfaces and 15 for vertical. If you want your beds to have a certain look then there should be one color among the range to suit you. Aquadecks: If you’re looking for a penetrating semi-transparent matte finish, this is ideal for either weathered wood such as railway sleepers or fresh, new wood bought from the hardware store. Its advanced UV protection means that your wood color won’t quickly fade to grey as untreated wood does. 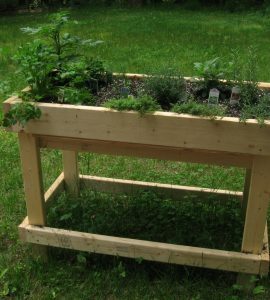 It also prevents the cracking and warping that can easily occur with raised beds. Tropitech: If you want an all in one treatment that’s ideal for the full range of outdoor wood, Tropitech ticks all the boxes. It gives a semi-transparent acrylic finish, protecting against UV damage while preventing damp from getting into the wood. It’s normally touch dry within a few hours and considered fully cured after a couple of days at the most. It has excellent longevity and will require minimal maintenance – up to every 5 years – which is perfect for raised beds. It’s perfect for tropical environments too so even in hot parts of the US it’s going to perform at its best. All our wood treatments are easy to apply. Any one is a suitable product for a variety of raised garden beds whether you have constructed them from hard or softwood, they’re new or weathered. If you want your beds to last for a long time and be protected fully from the elements, the Owatrol range should be top of your list of products to buy this spring.